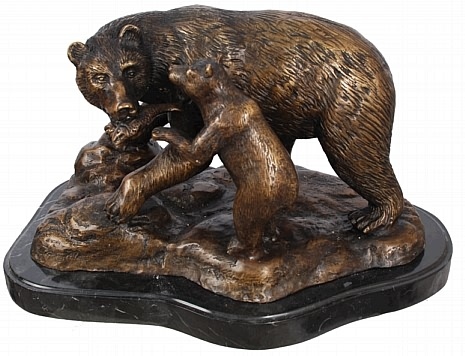 Add a wildlife accent to the desk or tabletop with this bear sculpture featuring a Mama Bear teaching her little baby bear on the means to hunt for fish. Set on a marble base. Sculpture is made of bronze. Dimensions: 12"H x 17" x 11"
Mother cubs usually have a gestation period of about 180-270 days and will have her baby cubs in the den while she is hibernating. She will have about two-four bear cubs as part of the litter. The little bear cubs are born tiny, and are both blind and deaf. They will weigh about 0.5 to half a pound but will grow in strength and weight quickly. The mother bear is protective and will wean and nurse her bears until April or May when the hibernation period ends. The baby bears will remain with their mother for 2-4 years in all and will be taught about survival in the wild. Mother bear will not mate during this time but when she does, the little bears might sometimes leave the den to avoid conflict with the male bear.